Winter’s moved out! It’s time to pack those snug blankets, coats, and snow boots, and welcome the much-awaited warmth of the sun. But, summer also means your fireplace will be without a fire for a while. When not in use, a fireplace can look uninteresting and awkward. Throughout winter, your fireplace and mantel were the focal elements of your living room, making your home feel warm and inviting. Why should this change in the summer? Fortunately, we have a few creative ideas that can help you transform your idle hearth into a functional and aesthetic home décor element during its off-season. Give your vacant fireplace a new lease of life and amp up your interior space with the clever ideas shared in this post. Go on, pick a favorite! Decorating the fireplace for summer is a great way to transform your home into a welcoming space for your guests. But, what about the foul odor fireplaces emit in this season? As the mercury level rises, the hot and humid conditions react with the soot and creosote layers in the chimney, making your fireplace smell like a barbeque that has gone bad. This is especially true in cities like Portland, Denver, and Phoenix that experience extreme weather and varied climatic conditions. Therefore, chimney sweeps in these cities offer customized services throughout the year, enabling households to keep their fireplaces spick and span in the off-season. For instance, a skilled Portland chimney sweep is aware that the city experiences heavy rains as well as strong sunshine for the most part of the year. Consequently, they tailor their chimney services as per the local weather conditions and use special techniques to get rid of the creosote formation. Further, fall and winter are the busiest seasons for chimney maintenance. Getting your chimney fully serviced at the end of winter will help you avail the special off-season rates and flexible appointments as per your convenience. Summer is the time to let some fresh air and greenery into your living space. Place a few indoor plants like cacti, ferns, succulents, and bonsai in the fireplace to render an invigorating appeal to your home. Use pots in various heights made of different material to add an element of interest to your fireplace. You can also make a terrarium or a glass greenhouse to place low-maintenance plants like succulents and perennials. Another way to welcome greenery into your idle hearth (without having to maintain it) is to decorate with faux plants, as well as dried branches and twigs in rustic metal buckets or ceramic pots of different sizes. All home improvement stores sell faux plants and flowers that can be artistically arranged to create a stunning statement in your living space. Missing your hearth’s warm glow? Use your vacant fireplace to place candles and lanterns of different sizes, colors, and aromas and add instant warmth and charm to your living area. What’s more? A few books and a cozy couch or chairs added to this space will make it even more welcoming. 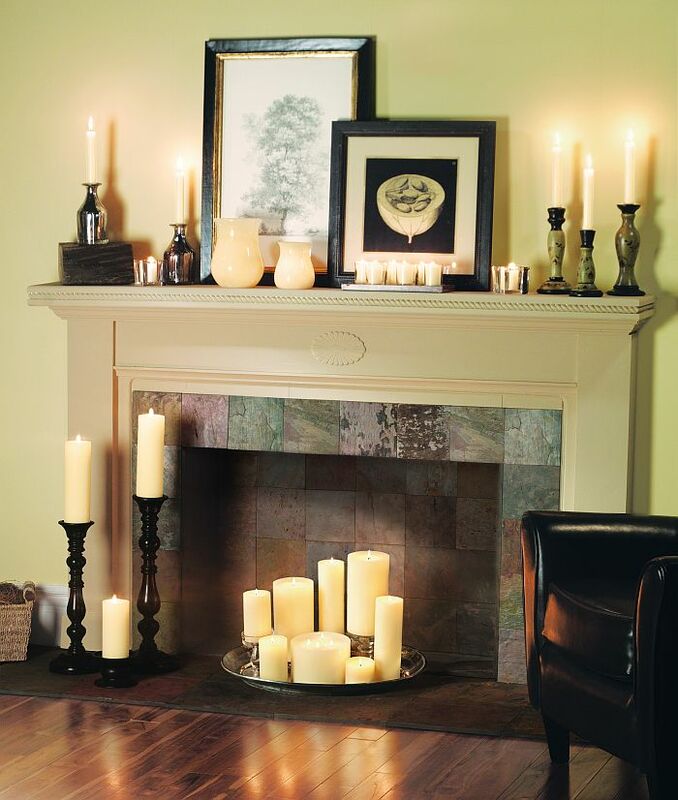 With their gentle flickering glow, candles can render a stylish and romantic appeal to a room. Brighten up your hearth for the spring and summer by using this elegant, easy, and inexpensive technique. During winters, everyone loves to gather around the fireplace in the company of their family and friends. Make your idle hearth equally inviting in the summers by converting it into an area meant to entertain you and your dear ones. If you like reading, place a handy bookshelf in the empty fireplace, enabling you to store and display your favorite collection of books and magazines. Want to flaunt your wine collection? Convert your fireplace into a home bar by placing a wine rack in it. Flaunt your exclusive wine glass assortment and cutlery on the mantel to complete the look and intrigue your visitors. Your fireplace is the focal element of your living area. Use this element effectively in the off-season to display your vintage finds and antique collection, making it a conversation starter for all your summer guests. A rustic metal candle stand, a unique sculpture, or a large attractive mirror can render an ultra-sophisticated look to your unused fireplace. Depending on the style of your room, decorate the hearth and mantle with an eclectic mix of curios, artworks, and antique collectibles to flaunt your personal taste and add character to the room. For instance, if your room has a coastal theme, place an exclusive collection of seashells and corals. Similarly, if the room has a neutral color palette, place colorful jars, vases, and collectibles in the fireplace area to add a hint of color and interest to the décor. Just because summer is here doesn’t mean your fireplace should be forgotten. This essential element of your home’s interior décor deserves a little extra attention and creative thinking in the off-season. Use the ingenious tips shared in this post to decorate your hearth and transform it into a wow-worthy space that reflects your artistic personality. These ideas are sure to add character to your décor and impress your visitors.